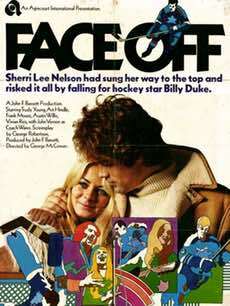 We defrost the classic Canadian hockey drama Face-Off for examination. Art Hindle plays the star rookie in the 1971 movie about the NHL lifestyle. Black Dog Video's Darren Gay joins William and Alexander to chat about unconvincing love stories, men's fur coats, old-school Maple Leafs and champagne showers. Find out more about the movies we mentioned on these IMDb pages: Face-Off, Youngblood, Hello Destroyer and One Sings, the Other Doesn't. We talked about Goon on an older episode. SCTV's parody of the movie is called Power Play. We appreciate you taking the time to comment, and we're truly grateful that you cared to listen, Art. I think I corrected the release year error later in the talk but, indeed, we could have gotten the background facts straight. We won't take your feedback lightly. Our goal is to encourage listeners to sample from the diverse catalogue and rich history of Canadian movies. We're not experts on the subject so our thoughts may be unrefined after a first watch of a movie. Please take our reactions as an honest reflection of the discovery process.